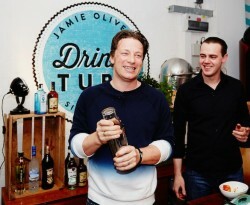 Gintime was lucky enough to go to the official launch of the partnership between Bacardi brands and Jamie Oliver to celebrate the arrival of Drinks Tube, the companion YouTube channel to Food Tube. It’s a marriage made in heaven between Bacardi, the world’s largest privately held spirits company and Jamie Oliver who has pioneered delicious home cooking through his many television series, best-selling cookbooks, Jamie magazine, and most recently, the online Food Tube series. Now, he has turned his attention to the joy of cocktail-making and as a result he has joined up with Bacardi to bring the fine art of cocktails to kitchens everywhere. With all leading spirits covered – Bacardi Rum, Grey Goose vodka, Bombay Sapphire Gin and Martini Vermouth – the idea is to simplify cocktail-making in much the same way that Jamie himself has encouraged people to experiment with making new types of food. Drinks Tube will showcase the talents of the world’s leading bartenders and indeed at the very splendid launch night Simone Caporale of The Artesian rocked an appreciative crowd with his classic daiquiri. Content is king on Drinks Tube and each Friday will see a new cocktail segment featuring classic cocktails such as espresso martinis and margaritas as well as seasonal creations. It’s not only about cocktails either, there will be tips on sourcing the best beers and wines. The partnership will also feature monthly content in Jamie Magazine and on jamieoliver.com, beginning with a series of Italian inspired recipes from Giuseppe Gallo, Martini Global Brand Ambassador. In fact it’s one of those projects where it’s hard to believe it’s never been done before. Hats off then to both Jamie and Bacardi Global Brands for having the vision to see that this is exactly where the great cocktail revival is going next.